NASA is developing a humanoid robot to perform medical procedures, including surgery, at the International Space Station and even en route to Mars. The robot, which is named 'Robonaut 2,' is now undergoing further development and tests at Houston Methodist Research Institute. Dr. Zsolt Garami, an instructor at the institute, told Computerworld that there is already a robot at the space station that can perform basic tasks, such as pressing buttons. However, he stated that Robonaut could serve a different, more advanced purpose than its predecessor – by acting as a nurse or physician. “Our motivation was really when we saw astronauts perform ultrasounds on each other or on themselves. Why not have a robot help? There’s already a robot up in the space station, and he’s already shown that he can switch buttons reliably. Why not make him a nurse or a physician?” said Garami. 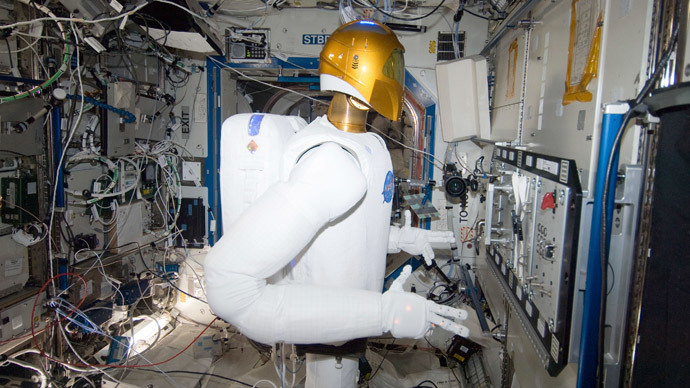 Robonaut 2, or 'R2,' is the twin of an earlier R2 robot which was taken to the International Space Station (ISS) in 2011. It has taken about 11 years to build the $2.5 million robot, which runs on 38 PowerPC processors. Those processors include 36 embedded chips that control the joints in its legs and arms. Garami said he is confident that the robot will not have any trouble at the ISS, adding that his humanoid student is working much faster and more dexterously than his human students. “I would say that within an hour I trained him more than with other students I’ve been working with for a week, so I think he’s learning really fast,” Garami said in a video released by NASA. In the video, the automaton performs an ultrasound scan on a mannequin and demonstrates using a syringe as if it were giving an injection. “His motions, without shaky hands, are very precise and gentle. There were no sudden motions,” Garami told Computerworld. Research shows that robots may be better at carrying out certain kinds of surgery than humans. A study by the University of Maryland School of Medicine in 2008 showed that patients who underwent minimally invasive heart-bypass surgery using a robot had shorter hospital stays, faster recovery times, and fewer complications than patients who had undergone traditional surgery. Garami wants Robonaut to perform surgery in space one day. “Say you're sending two people to Mars and one has a medical emergency. One astronaut needs help but they're going to be 15 to 20 minutes with no video signal. They're left alone with no connection to Earth...I feel Robonaut could be a partner for them, helping them," he said. Robonaut can't perform surgery just yet, but it is just about ready to perform CPR. But Garami also has earthly intentions for Robonaut, believing the robot could be a huge asset to the military. He says that instead of sending a nurse or an army medic to save a life, Robonaut could carry the soldier out of danger and give medical assistance at the same time. A spokesperson for NASA was a bit more grounded about how soon Robonaut might be on active duty, whether in space or on the battlefield. “We are really just starting to explore this capability down here on the ground, and theirs is a significant amount of research to do before we would be able to make the jump to space,” he said.